The Utilities Division ensures the safe operation of all gas utilities through enforcement of federal and state pipeline safety regulations. 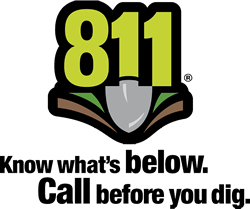 Whether you are planting a tree or undertaking a larger project, your first step should be to call 811. Homeowners and contractors can prevent damage to underground utilities and prevent service interruptions by calling 811 at least two working days prior to excavating. It's free, easy, and it's the law! Is there a fee for a utility locate through 811? How long does it take to get an underground utility locate through 811? How are easements and right of ways determined? File a complaint against my utility. Make a public comment on a rate case. Request an underground utility locate. Report damage to an underground utility.